Once you dip your toes into the world of collecting Rolex watches, it’s hard to walk away. Rolex regularly announces new timepieces, from upgraded classics and throw-back watches to the rare brand new model, which turns collecting them into a passion for some. Their catalog, past and present, is extensive, offering various dress and sports references to suit many budgets and lifestyles, which can seem overwhelming to the novice collector. Below I’ll dive a bit deeper into the history and catalog of the brand so that your next purchase will be a well-informed one. Rolex was founded in 1905 by Hans Wilsdorf and his brother-in-law Alfred Davis. In the beginning, the brand outsourced the materials used for their watches from other companies, using imported Swiss movements as well as cases manufactured by other brands. A few years later, Rolex began producing their own components and the name Rolex began to appear on every timepiece. 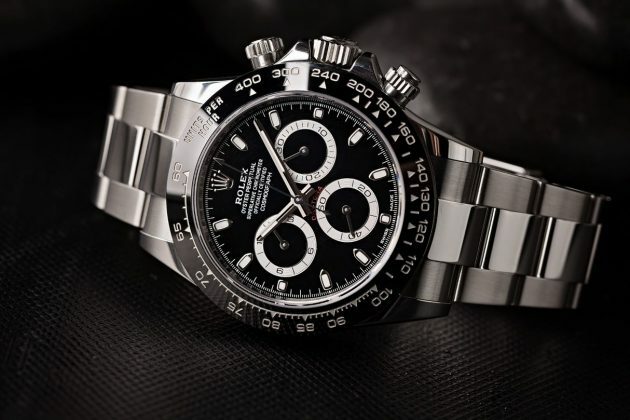 Some of the brand’s most notable accomplishments over the past several decades have been the invention of the world’s first waterproof watch via the Rolex Oyster, the first automatically changing date display, and the development of their perpetual movement, which boasts a chronometer-rating and innovative self-winding technology. As previously mentioned, the Rolex brand boasts an impressive collection of new and pre-owned watches, which can make choosing the perfect timepiece seem like a daunting task. Thankfully, Rolex offers timepieces to suit almost any budget that range in different metal options, movement complications, and dials that can all significantly affect the price of the individual watch. With a stainless steel finish and a simple, time-only function, the Air-King is often considered the quintessential entry-level Rolex. Recently, actor Ryan Gosling was spotted wearing a stainless steel vintage ref. 5500 on the red carpet, peaking the interest of collectors everywhere. Prices range from $3,000 used to $6,200 for the newest ref. 116900. 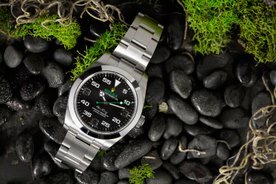 Similar to the Air-King, the Explorer features an affordable stainless steel finish as well as a time-only dial and does not offer the rotatable bezel that many sports models feature. Prices range from $5k used to $6,550 retail. The two-tone Datejust will appeal to most budgets, offering a used price as low as $3k and a retail price starting around $12,550 for a 36mm diamond dial ref. 126233. The brand’s most iconic two-tone dress reference pairs stainless steel with either white gold, yellow gold, or Everose and features several case sizes from smaller women’s cases to a robust 41mm men’s case, resulting in a broad range of prices. 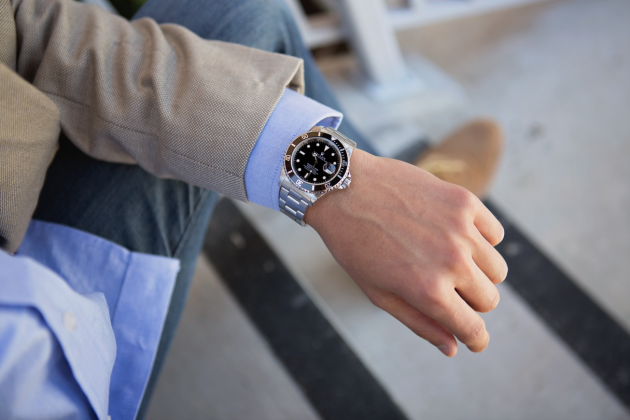 Most Rolex enthusiasts will argue that no luxury watch collection is complete with the addition of at least one stainless steel Submariner. Often dubbed the “James Bond Watch”, anybody who is anybody owns at least one. On the market since the 1950’s, the iconic diver also boasts a wide selection of feature sets and price tags, with stainless steel variations selling for just over $6k used and $8,550 retail. Two-tone and all-gold references are available on the market as well but command a higher price. The Day-Date is always produced using precious metals and gems and commands a higher price. Its reputation alone warrants adding at least one to your collection if you have the budget to do so. Most notably the Day-Date has appeared on the wrists of former Presidents Richard Nixon, Ronald Reagan, and Lyndon B. Johnson, earning it the nickname the “President’s Watch”. Prices range from just under $7k used to $34,850 retail for the 40mm ref. 228238. The Daytona is the epitome of sleek watch design appearing on the wrists of many well-known collectors, from Paul Newman and Sir Jackie Stewart to avid watch collector Eric Clapton. The Daytona boasts a complicated chronograph movement and rotatable Tachymeter bezel. Metal options include stainless steel, two-tone, and all-gold and can be purchased starting at just over $11k used or upwards of $43,700 for the new Everose and diamond ref. 116505. The most reliable source to purchase a Rolex through is from an authorized dealer. If you don’t currently have the budget for a new timepiece, consider buying a used Rolex through a respected and well-known source, such as a secondhand website such as BobsWatches.com or a jewelry store. While eBay might seem like a tempting source with their recent authentication guarantee, most collectors would advise against it as many counterfeit, and bad deals tend to come from that platform.